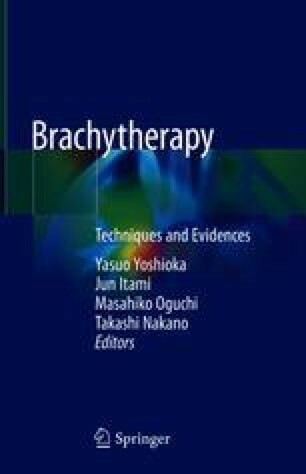 High-dose-rate (HDR) brachytherapy as monotherapy for prostate cancer has theoretical advantages in both aspects of radiation physics and biology compared to other radiotherapy modalities. The three-dimensional and four-dimensional dose distribution of HDR brachytherapy is superb, and HDR monotherapy maximizes the biological dose escalation. In the former part of this chapter, techniques in implant and treatment planning of HDR monotherapy are mentioned, followed by it’s theoretical advantages. In the latter half, clinical evidence of HDR monotherapy is overviewed along with its history over 20 years. Since its dawning with four- to nine-fraction regimens, HDR monotherapy has been moving on to more and more hypofractionated regimens. The latest two- or single-fraction HDR monotherapy is vigorously discussed. National Comprehensive Cancer Network (NCCN) Clinical Practice Guidelines in Oncology. Prostate Cancer. Version 2.2017. http://www.nccn.org/professionals/physician_gls/pdf/prostate.pdf. Accessed 4 Oct 2017.